As one of the top music instructors in the area, D. Scott Williams is a drummer, educator, author, and the owner of Drum Works School of Music in Orefield Pennsylvania. Scott began playing professionally at a young age over 30 years ago. He has since played throughout the US as well as on European tours. Scott enjoys a busy performance schedule and plays with a wide variety of artist of different styles. Currently, he can be seen playing live with Pennsylvania guitar legend Mike Dugan, Jake Kaligis and the New Constitution, instrumental funk/fusion trio Drop3, and guitarist Scott Bradoka. Some other artists that Scott has recorded or performed within the past include: Idle Threats, Rhino Campground, Steve Brosky, New Amsterdam and many others. 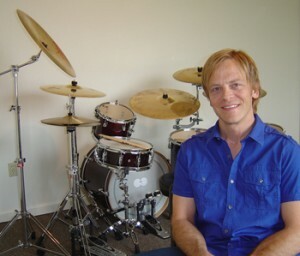 Scott Williams is the author of several instructional drum books. They include “The Funky Six”, and “Drum Fills… The Basics and Beyond”. Both are available internationally from Mel Bay Publications. In constant demand as a drum lesson instructor in the Lehigh Valley, he enjoys a busy teaching schedule. For over 15 years, Scott has taught drummers of all ages and skill levels. He has created a strong drum curriculum drawing on years of experience performing, recording, teaching and his life long study of the art of drumming. This enables Scott to offer something to drummers of all styles, ages, and levels of experience. His students vary from absolute beginners (both young and old!) to experienced players looking to further their abilities, and even other drum teachers. For more specific information about Scott’s drum instruction and curriculum, please see the Music Lessons page of this website, or call 610-391-0720. Scott has studied at the prestigious Drummer’s Collective in NYC with master teachers Kim Plainfield and Frank Katz, and also with Jimmy DeGrasso (Megadeth, Alice Cooper, Y&T) along with numerous other gifted teachers. The high standards that were set by these music instructors and teachers remain an important influence on Scott as an educator. In addition to teaching at his own studio, DrumWorks School of Music, Scott has taught for over 10 years at the California Drum Shop, The Community Music School in Allentown, PA (1984-1985) and was the Percussion Instructor for the Parkland High School Marching Band (1985 & 86 seasons). Scott is a Vic Firth Artist, and is a member of the Vic Firth Education Team and The Percussive Arts Society. Gus Schnable has been a professional musician for over 24 years and has been teaching for the past 13 years as one of the areas leading music instructors. Well versed in numerous genres of music, including jazz, funk, R&B, rock, metal, and classical, Gus enjoys a full roster of students and is continually active in recording and performing in various group settings. Gus holds a Master’s Degree in Music Theory from Temple University. He received his Bachelor’s Degree from Berklee College of Music with a concentration in Jazz Theory and Arranging. He is an active member of The Society of Music Theory, The Music Theory Society of the Mid-Atlantic, and an avid participant in the SMT Jazz and Popular Music discussion groups. In March of 2004, Gus presented a paper at the Mid-Atlantic music theory conference in Philadelphia based on his research in Generative Theory and its applicability to jazz music, specifically in the music of Charles Mingus. With his education and professional experience, Gus has had success in helping students with placement into college music programs throughout the country. For 13 years, Gus has maintained a thriving private teaching practice in and around the Lehigh Valley area. He has also held an adjunct teaching position at Lehigh University in Bethlehem, PA (2006-2009). Since 2005, Gus has been a Sound-Test Consultant for the C.F. Martin guitar company. Some groups that Gus has recorded and performed with include: Rhino Campground, Devils Half Acre, Scott Bradoka, Flirtin’ with Mama, The Starlites, and Blitz. He has also done pit orchestra work for the Civic Theater in Allentown, PA for the Who’s rock opera “Tommy”. 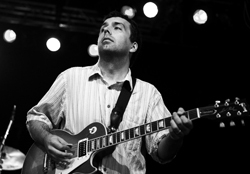 In the summer of 2006 Gus toured Germany with Scott Bradoka opening for Jeff Beck and Buddy Guy. In 2008 he headed back to Europe, making stops in Germany and Prague with Scott Bradoka and the Staggering Evil Genius’, touring as a support act for Robert Cray, The Hooters, and Dicky Betts. Currently, Gus can be heard playing with the instrumental funk/fusion band Drop3 and the ten piece R&B/Soul band Flirtin’ with the Mob.